Happy Thanksgiving, y’all! (I’m in Mississippi this week – can you tell?!) As a way to thank you for being such loyal customers over the past year, I want to give you an extra day to save with your Black Friday discount! 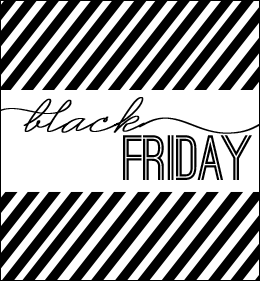 Use the coupon code BLACKFRIDAY to save 15% on any order from my Etsy shop! Begin taking advantage of the sale on Thanksgiving Day at 12 a.m. and continue to save until 11:59 p.m. on Friday, November 25. **Coupons not valid with any other offers and may not be combined. ← Christmas Card Designs | They’re Here!